I have an Nh.D. It’s similar to a Ph.D., except with an N. This one means Doctorate in Nursing Homes. I got it at the University of Experience. One day my mother moved into a nursing home. On another she died there. What happened in between changed my life. 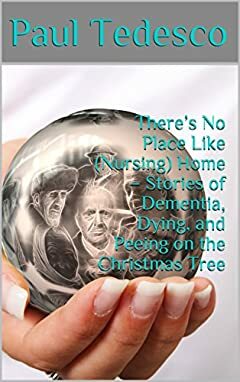 There’s No Place Like (Nursing) Home – Stories of Dementia, Dying, and Peeing on the Christmas Tree is a book for my friends, almost all of whom I haven’t met. There are 80 million of them across the country. They’re called Baby Boomers. They, like me, are getting older. So are their parents. Many, my friends and their parents, are or will end up in nursing homes. Most who do will die there. Whether my friends learn to smile in between can change their lives too. The book is a short folksy memoir, a compendium of stories, real ones, filled with heartbreak and agony, as well as laughter and mirth. Shudder as judge and jury shout out their daily verdict – guilty as charged – for daring to take mom from her home of fifty-plus years. Listen as she painstakingly tells us, day in and day out and in no uncertain terms, that she wants to go back. Sit in the mortuary as – still in shock over the ‘new normal’ – we begin planning her funeral, long before she dies. Hold your nose for stories about diapers, hers, and sons learning to parent their parents. Hold your ears as a gentle and loving mom curses in words that would shame a sailor and which, B.D. – Before Dementia – she would have been embarrassed to hear, much less say. There are stories about her ‘friends,’ from a roommate asking if we have seen her son, and asking again tomorrow, the day after, and the day after that, to a middle-aged man whose wife has likely been sentenced to decades – that’s right, decades – in her new home. The stories are about what I saw, learned, and felt, and how I learned to smile again, then and now. An old man mistaking a Christmas Tree for a toilet will do that. Three-part dementia-inspired operas will do it as well. So will listening to your saintly mom call a white nurse a “honky.” I cried, long and often, but in learning to look in the right places, I found laughter amidst my tears. In the midst of the tempest, I also found serenity for a troubled soul. So can my friends.